Vegetables are more interesting in a hot air fryer, so you may find yourself eating a lot more of them. If nothing else, you’ll be making a lot more chips / French fries. So if you’ve lived without a vegetable scrubbing brush up till now, you may find yourself in want of one. A vegetable scrubbing brush, also sometimes just called a “vegetable brush”, is mostly useful for root veg that grew in the ground. It lets you scour dirt out of their skins. Some models are just a brush. Some models, such as the one pictured, combine the brush with a peeling mechanism, plus a sharp “digger” at the end for digging potato eyes out. Some combo units may seem like a good idea, though not all combinations can feel right / work right as a peeler in your hand. You mostly use a vegetable scrubbing brush on root veg that you plan to cook and eat unpeeled — such as potatoes and carrots. For veg that you plan to peel, it’s a waste of time to use the brush on them. But always give any veg a good wash, even if you plan to peel them, because otherwise your knife / peeler can drive unseen surface pathogens into the flesh of the vegetable. Yuck. 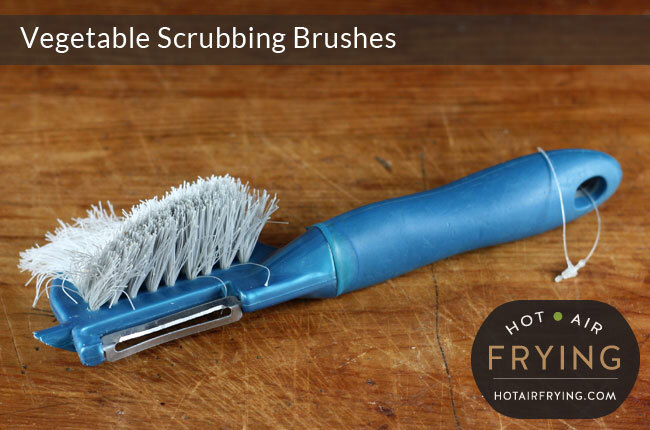 To use a scrubbing brush: if you are just planning on washing up a handful of veg, you can do it under running water. If you are going to be doing a lot, set yourself a small sink of water. Dunk the veg you are going to be scrubbing in the water, and scrub all sides lightly. Press more heavily where needed to get rid of visible dirt. Then give a final rinse in clean water or under running water. This shouldn’t take any more than 15 to 30 seconds per veg. After use, rinse the brush well and let dry before storing away. Most are also dishwasher safe. There are so many different types available. There’s not really one model I can recommend because, to be honest, even though it’s fast and easy, it’s still a boring chore I dodge as often as possible. You can probably pick one up at your local dollar / pound store. But if you want to at least first browse the types / options / prices out there, for your convenience here’s the Amazon search link for vegetable brushes.